Glin Castle is the ancestral home of the FitzGerald family, Knights of Glin. The FitzGeralds first settled here in the 1200’s at nearby Shanid Castle following the Norman invasion of Ireland. In the early 14th century the Earl of Desmond, head of the Geraldines, made hereditary Knights of 3 illegitimate sons he had sired with the wives of various Irish chieftains, creating them the White Knight, the Green Knight of Kerry and the Black Knight of Glin. For seven centuries they defended their lands against the troops of Elizabeth I, and during the Cromwellian plantation and Penal laws. Several colourful characters have held the title, including Edmund, Knight of Glin, whose son was taken hostage and tied to the mouth of a cannon during the famous Siege of Glin in 1601; to the much loved 25th “Knight of the Women”, who installed mistresses in each of the Gothic lodges; to “Cracked Jack” the 26th knight, who used to ride his horse up the flying staircase to bed. The 29th and last Knight, Desmond, was perhaps one of the most colourful of all. A respected scholar of Irish art, he also kept the FitzGerald tradition of entertaining and hospitality alive in the castle, something which continues to this day. His grandson will become the 30th. 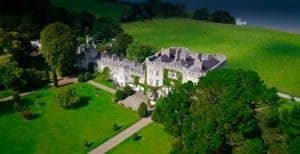 Glin Castle is available to hire exclusively for private rental accommodation, events, weddings, golf tours, group tours of castle and gardens with lunch and film location.